The latest Betfair promo code is a valuable deal to get you started with their sportsbook. We explain how to make the most of it. Betfair has its roots in an innovative exchange product that revolutionised online gambling in the early part of the century. In the days where you used a bookie to place a bet and literally nothing else, its peer to peer betting was a breath of fresh air. In the years that have followed Betfair has continued to innovate and has expanded to be an absolute giant of the online betting world. This review looks at the sportsbook arm of the operation. There are two key parts of the famous Betfair brand, their extremely popular sportsbook, and the game changer that is the exchange. In the following review, we’ll focus on the sportsbook, casting our expert eye over what’s good about the service and how users can get the most out of the promotions offered. We look at the sign up offer, recurring promotions for existing customers, as well as mobile, banking and how the customer service team handle business. There are a number of promotions currently running on the Betfair sportsbook platform, so plenty of reasons to open an account with Betfair. Chief amongst these is a fantastic offer available exclusively to new customers: Get up to £100 in free bets. An ideal way to have a good look around the site and find out what they have to offer, what they’re doing right, and how they are striving to beat the competition. For a small investment you will have some bonus cash to play with, surely more than enough to get started. Who knows, you could win big! Beating the bookies is what we’re after, but beating them with their own money off a free bet, well that is sweet. Here’s how to get your slice of the pie. Open a new online betting account with Betfair sportsbook – it’s really quick and really easy, and won’t take more than five minutes – then make your first deposit (usually it must be £10 or more). You’re now well on your way to winning, and apart from the free bet and potential profit that’s coming your way, you are also now part of one of the most popular, forward thinking and ambitious bookmakers out there. Next up you need to meet the trigger and wagering requirements. These are not particularly restrictive, so you should be covered if you are making any sort of average wager. The exclusions would kick in with very short prices etc. Once you’ve met the qualification requirements you’ll shortly see the bonus funds arrive in your account. Simply make sure you meet any additional requirements and enjoy the boost to your betting bank. Betfair isn’t your average bookie, check out this recent promotional video with the Barcelona team for something a bit different! Is there an Betfair promo code for existing customers? When accessing the Betfair homepage, you’ll find the promotions tab running across the bar navigation at the top of the screen, this is the best way to find out what’s currently being offered to existing customers. They update a lot of their promos to keep pace with the major talking points in the sporting calendar, so this page should be your first port of call. We pick out a few of the more eye-catching recurring offers. Acca Edge – the new poster promo for Betfair, and they’re certainly proud of it, but so they should be. Heard the hype and want to give it a try? Betfair will award you up to a 20% profit bonus on your first acca edge. If you don’t know what Acca Edge is, it’s an insurance offer with a difference. Get your stake back on accumulator bets with three or more selections if you lose by one leg. What’s great about this is most of Betfair’s rivals want at least five legs down, but Betfair give you more of a chance to get your money back by extending it to cover trebles and above. Take advantage of this, and if you get a winner, they’ll add the bonus on to your winnings. So, win and you’ll get a pay-out plus a 20% bonus, lose and there’s every chance you’ll get your stake back to have another go. Offer overview Get up to £100 in free bets. Bonus allocation Free bets for Betfair sportsbook. Expiry Free bets expire in 30 days. Further terms Deposit via card or Paypal to qualify. Withdrawal restrictions and further terms apply. Please see Betfair for full details. Betfair offer best odds guaranteed. We should all know what this is by now, and why you simply have to have it on side when placing your horse racing bets, but if it’s still new to you, we’ll give a quick highlight. Place a bet on any UK and Irish horse race, take the price about your selection and if the SP is bigger, you will get paid out at the better odds. It’s fast becoming commonplace in the industry, but if your current firm don’t offer it, get over to Betfair. You can also watch your racing bets live through their state of the art streaming service. Get on any UK and Irish race for a minimum 50p stake and watch the race unfold. No more betting blind and checking results with your fingers crossed. The stream is responsive with no lags. Enjoy a bet on the golf? Many do. It’s one of the best ways to secure a share of value and have a punt on a big price selection. Check out the major events from the European or US Tour and have a flick through the prices, more often than not the favourite will start at double-figure odds. What that means is you can back a player like Rory McIlroy to win a major, for example, and get a great price about him. However, what we prefer to do in golf betting is look further down the field and pick a handy outsider and play them each-way. Most firms pay four or five places, but Betfair love to give you value by enhancing that, and at the major tournaments they will pay out on the best seven or eight home. That gives you more chance of landing a profit. As well as their long list of promotions and special offers, they also do the basics right, offering a bigger price than their competitors in the markets everyone is talking about. Betfair traders constantly trawl through the price comparison sites to ensure they are the biggest price on what matters. This promise covers the likes of tennis, all English football and rugby. That means if you’re betting on the weekend football, for example, there really is no better place to get on, as you’ll get the most for your money. Check the homepage for the day’s multiple bets, accumulators picked out by the trading and marketing team that they think will give you a great chance of bagging a winner. We like picking our own bets, of course, but if you’re on the move, and want an interest for the day without spending time running over form, figures and past results, this is perfect. 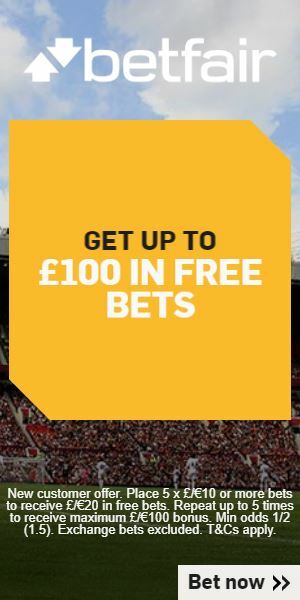 Take your pick from the list on offer and Betfair will boost the price up to ensure you can play for small stakes, with a chance of winning big. There’s odds to suit every pocket and backer here, from favourites to outsiders. Want the benefits of the desktop site right there in your pocket? Download the Betfair mobile app from the app store for free. You can take full advantage of the new customer offer through your mobile or tablet. Plus you can cash out on your bets whenever, wherever you want, bet in play on a number of markets in an ever-increasing number of matches, and get your hands on daily price boosts. One of the slickest apps of its kind, you’re able to bet on football, racing or sports at the click of a button, meaning everyday situations, such as shopping trips, waiting for a bus or long journeys can be transformed into a thrilling betting experience. Betfair adopt numerous technologies to protect your personal details, ensuring you can enjoy a bet on sports with peace of mind, knowing your bank numbers and sensitive information is protected to the fullest. There’s a number of ways to get funds in or out of your Betfair account, including the most common methods – credit/debit card transactions. You can also benefit from EWallet methods such as Skrill, Neteller and you can use Paypal to give you the quickest access to your cash. Betfair advise a 3-5 day waiting period for funds to show up in your bank after withdrawing. You can contact the customer service team through email, telephone or Live Chat, but we’re going to talk you through the easiest way to problem solve, all without having to speak to anyone. Click ‘help and contact us’ at the bottom of the homepage, you’ll then open the help centre. It has a glossary of questions and answers covering every possible scenario in sub-headers, or you could type the keywords of your issue into the search bar and that’ll bring up a long list of answers. We have detailed the key information around this sign up offer in the info box above. Here’ll you find the main considerations when you join Betfair with this promotion. Remember that these are just a summary for ease of access. The full terms and conditions must be confirmed on the Betfair site before you proceed. We have taken the decision NOT to republish them here as they are regularly subject to change and we want to ensure you have seen the latest version before registering.